2016-JAN: Is the Theory of Evolution "just a theory"? In TV crime programs and in ordinary life, "theory" usually means a tentative guess, sometimes based only on a hunch with little or no evidence. 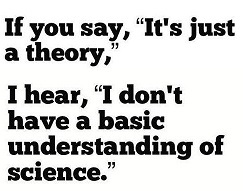 In science, a theory starts with a tentative guess. However, this must be followed up with experiments to discover whether the hypothesis has validity. It is only when the hypothesis is verified by other scientists and is generally accepted as accurate by the scientific community that the hypothesis becomes a theory. The vast majority of scientists who are not creationists have reached a consensus that evolution has become a scientific theory, is reliable and is a fact. We live on top of the Earth's crust which has a thickness of 0 to 100 km (60 miles). Directly under the crust lies the Earth's mantle. A team of scientists traveled to the middle of the Atlantic Ocean, where the crust has minimum thickness. They drilled down through the crust and collected rock samples from the top of the mantle. The team was led by co-Chiefs Dr. Gretchen Früh-Green (ETH Zurich, Switzerland) and Dr. Beth Orcutt (Bigelow Laboratory for Ocean Sciences, USA). They were aboard the Royal Research Vessel James Cook, which was operated by the National Environment Research Council, UK). "... formally known as the Mohorovicic discontinuity ... the division between Earth's brittle outer crust and the hotter, softer mantle." They extracted the rock cores for analysis. "... an unprecedented sequence of rock samples from the shallow mantle of the ocean crust that bear signs of life, unique carbon cycling, and ocean crust movement. ..."
Any findings about the beginnings of life on Earth may well impact the opinions of many North Americans who believe in the literal truth of the creation stories in Genesis, and of an Earth that is less than 10 millennia of age. One of Einstein's century-old predictions has finally been confirmed: gravitational waves do exist: During 1915, he predicted that major disturbances anywhere in the universe will cause space-time "to stretch, collapse, and even jiggle." 3 The result would be gravitational waves sent through the Cosmos that might be detectable on Earth. About a billion years ago, two black holes circled each other and eventually merged. When they collided, they emitted the energy equivalent to a billion trillion (10 to the 21st power) suns spread over a fraction of a second. This generated gravitational waves. Galileo first looked at the universe in 1611-MAR to detect light originating from stars and sunlight reflected from planets. Over three centuries later, scientists started to detect radio waves from the Sun, planets, and the rest of the universe. Now a third phase has been reached in which gravitational waves from the Cosmos are being measured. This discovery will have minimal effects on religious beliefs. However it does support scientific calculations of the age of the galaxy which has been estimated at about 13.82 billion years. 5 This is enormously greater than the approximately 6 to 10 millenia estimated on the basis of a literal interpretation of the biblical book of Genesis.